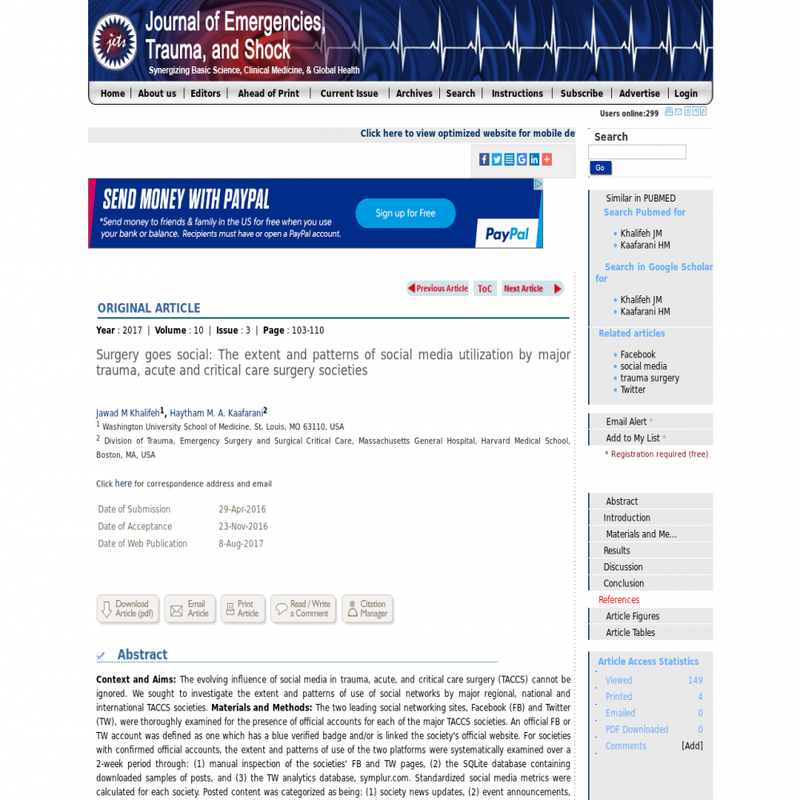 The evolving influence of social media in trauma, acute, and critical care surgery (TACCS) cannot be ignored. We sought to investigate the extent and patterns of use of social networks by major regional, national and international TACCS societies. The two leading social networking sites, Facebook (FB) and Twitter (TW), were thoroughly examined for the presence of official accounts for each of the major TACCS societies. An official FB or TW account was defined as one which has a blue verified badge and/or is linked the society's official website. For societies with confirmed official accounts, the extent and patterns of use of the two platforms were systematically examined over a 2-week period through: (1) manual inspection of the societies' FB and TW pages, (2) the SQLite database containing downloaded samples of posts, and (3) the TW analytics database, symplur.com. Standardized social media metrics were calculated for each society. Posted content was categorized as being: (1) society news updates, (2) event announcements, or (3) general medical information. From a total of 64 TACCS societies, only 27 (42%) had FB and/or TW accounts. Ten out of the 12 American societies had accounts compared to 13/39 of European, 2/9 of Australasian, and 0/2 of international societies. For the societies with social media presence, the mean numbers of monthly tweets and FB posts per society were 22 and 8, respectively. We summarize the FB and TW activity of the studied TACCS societies. Most tweets/posts were society news updates and event announcements intended to the society's constituents not the general public. A text cloud was constructed to summarize the major featured topics. Less than half of the TACCS societies are currently using social media; those that do are arguably underutilizing its potential. Non-American societies in particular lag behind in their use of social networking.